The UK Appalachian Center is proud to welcome Crystal Wilkinson for a mini-residency that will include an Appalachian Forum entitled: Birds of Opulence: Black Women, Madness, and Resilience in Appalachia. This event is free, open to the public, and will be held on Thursday, March 23, 2015 from 7:30 p.m. to 9:30 p.m. in the UK Law School's Auditorium (please, enter through the Memorial Hall side entrance of the building). Ms. Wilkinson will give a public reading and hold a discussion with attendees. There is a public reception at the UK Appalachian Center, 624 Maxwelton Court from 6 p.m. to 7 p.m. before the reading and discussion. Please join the UK Appalachian Center at an Appalachian Forum with Dr. Fran Ansley, Professor Emeritus of law at the University of Tennessee Knoxville on Wednesday, November 5, 2014. Dr. Ansley will give a talk entitled Telescoping Movements, Telescoping Time: Five Decades of Looking for the Labor Movement through an Appalachian Lens in the Niles Gallery from 3:30 to 5 p.m. This is a part of the Appalachian Forum Speaker Series on Civil Rights, Labor and Environmental Movements in Appalachia. The event is free and open to the public. Please join the UK Appalachian Center for an evening with Mimi Pickering as part of our Appalachain Forum Series on Appalachian Labor, Civil Rights, and Environmental Movements. This is a free and public screening of "Anne Braden: Southern Patriot" followed by a discussion of the film with the Director and Producer of the film, Mimi Pickering. The event will be held in Memorial Hall from 7:30 p.m. to 9:30 p.m. on Thursday, October 2, 2014. Listen to the podcast here. Produced by Cheyenne Hohman. 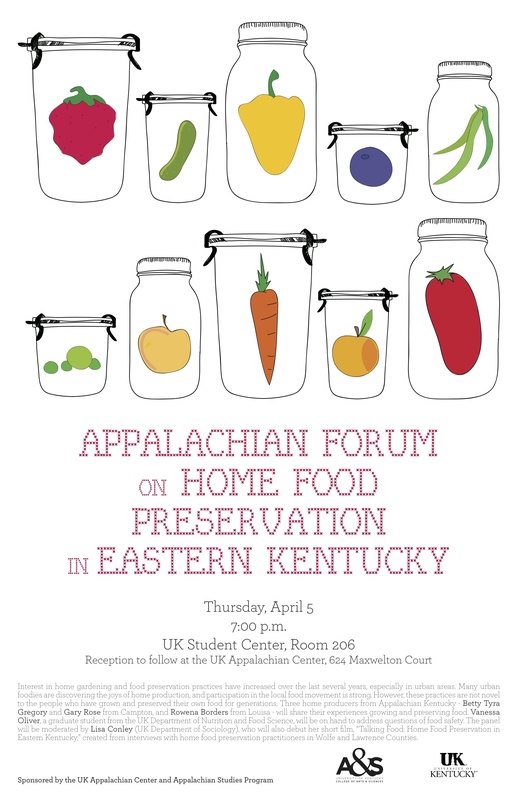 The Appalachian Forum on Home Food Preservation will take place on Thursday, April 5, 2012 at 7 p.m. in room 206 of the UK Student Center. Please visit our Video page to watch the forum on Hydraulic Fracturing that took place February 23, 2012.